This study was aimed to determine the reasons for extraction of permanent teeth in patients who applied to Necmettin Erbakan University Faculty of Dentistry in Turkey. A clinical survey was done for the patients ranging in age from 11 to 79 years that has undergone tooth extraction at department of oral and maxillofacial surgery. The permanent tooth extraction reasons were recorded excluding third molars. Reasons for tooth extraction were assigned to eight groups: tooth caries, periodontal disease, orthodontic, endo-perio lesions, preprosthetic, patients request, trauma and other reasons. Additionally, frequency of tooth brushing and dental visit, sociodemographic datas such as age, gender, residence place, education and income level were recorded for each participant. Obtained data were statistically analyzed by using descriptive statistics and chi-square test with a significance level at p<0.05. A total of 792 teeth were extracted from 487 patients. Males were 50.7% while females formed 49.3%. The reasons for extractions were: tooth caries 39.6%, periodontal disease 31.2%, orthodontic 1.8%, endo-perio lesions 17.5%, preprosthetic 6.8%, patient request 2.1%, trauma 0.8% and 0.2% other reasons. The tooth type most frequently extracted was the first left mandibular molar. The tooth type least frequently extracted was the left mandibular canine. Both caries and periodontal disease were the main reasons for tooth extraction in this Turkish subpopulation, so that proper oral health system including efficient programs focusing on prevention and treatment of these diseases should be created and developed. Oral health requires the permanent teeth retention as long as possible because the teeth are important not only for functional reasons but also esthetics (1,2). Tooth extraction should only be performed if heavily recommended as a part of dental treatment (1). Tooth extraction can be related to many factors mainly classified into clinical and non-clinical. Clinical factors are dental caries, periodontitis, dental trauma, eruption problems (impactions, pericoronitis), prosthodontic reasons and orthodontic reasons. Nonclinical factors include socioeconomic demographic characteristics, lack of education, oral hygiene habits, lack of awareness and patients demand of tooth extraction even after restorative treatment (2). Takala et al. (3) stated that older, less well-educated, poorer, rural and male population lost teeth more frequently. Several studies have been conducted worlwide on this issue and most of the studies indicated caries is the major cause of tooth extraction. Additionally, with aging the causes of extraction differs and periodontitis becomes the leading cause (especially after years of 40) (2,4-8). Caries and periodontal diseases are looks like the two main reasons of tooth extraction (4,5,9). Tooth loss is in close relation to financial and economic situations of the patients (8). Populations with poorer socioeconomic profiles have shown higher prevalence of tooth loss (10). Turkey is a country in development progress and developing countries have the limitation of health resources. This situation may lead to prefer simple dental care procedures like extractions (2). The lower prevalence of tooth loss in developed countries can be explained by preventive programs and higher accessibility to the oral health care (10). An understanding of the tooth extraction reasons is vitally important to improve oral health (11). There have been no recent studies regarding the current reasons for dental extractions in Turkey. The aim of this study was to find out the reasons for the extraction of permanent teeth in patients operated in the Department of Oral and Maxillofacial Surgery in a Dental Faculty. A clinical survey was done for the patients that has undergone tooth extraction at Department of Oral and Maxillofacial Surgery in Necmettin Erbakan University Faculty of Dentistry between 2016-2017 years. Research protocol was approved by the Ethical Committee (project no: 2016/006). Four hundred eighty seven patients were included in the study ranging in age from 11 to 79 years. Patients were divided into seven age subgroups (Table 1). Out of 487 patients 247 were male and 240 were female. An informed and written consent was taken before participating the study. The permanent tooth extraction reasons were recorded excluding third molars. Because the study range of age is not reliable for presence of third molars and they have congenitally missing and/or impacted nature. The diagnosis was done based on both clinical and radiographic examination by one investigator. Reasons for tooth extraction were assigned to eight groups: tooth caries, periodontal disease, orthodontic, endo-perio lesions, preprosthetic, patients request, trauma and other reasons (local pathology, tooth impaction, and iatrogenic). Additionally, frequency of tooth brushing and dental visit, sociodemographic data such as age, gender, residence place, education and income level were recorded for each participant. Data analysis were performed by SPSS ver. 21.0 (Chicago, IL, USA). Obtained data were statistically analyzed by using descriptive statistics and chi-square test with a significance level at p<0.05. A total of 792 teeth were extracted from 487 patients with a mean of 1.62 extraction per person during the study and 6.34 teeth were missing for per patient. Of the 792 teeth extracted, 336 were from females and 456 were from males. Of the 792 teeth extracted, 530 were from the participants of age over 40 years and 262 were from the participants of age under 40 years. The patients were divided into seven age subgroups and the distribution of the extracted teeth according to age subgroups were given in Table 1. Mean age of the study population was 43.46±14.95. Males were 50.7% while females formed 49.3% of the sample. Some sociodemographic data such as age, gender and education were given in the tables (Tables 1, 2). The reasons for extractions were: tooth caries 39.6%, periodontal disease 31.2%, orthodontic 1.8%, endo-perio lesions 17.5%, preprosthetic 6.8%, patient request 2.1%, trauma 0.8% and 0.2% other reasons (tooth impaction for one patient) (Figure 1). The reasons for tooth extraction were about the same rates in males and females and there was no statistically significant difference (p>0.05, p=0.217) (Table 3). 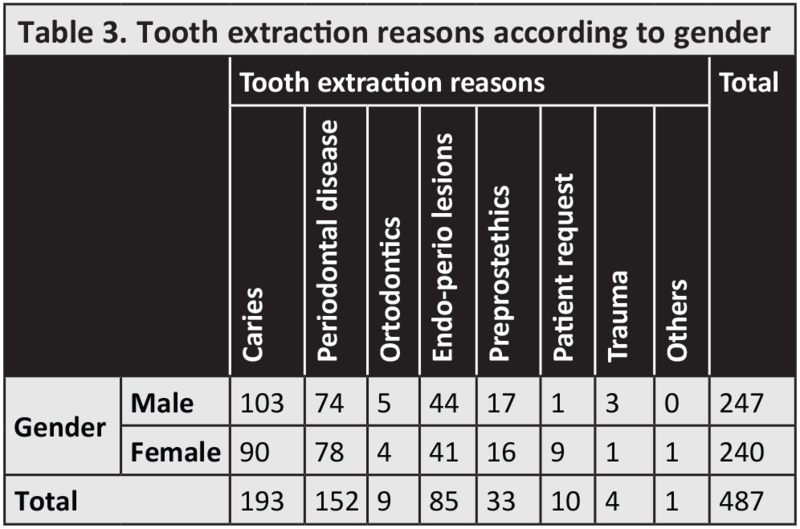 Tooth caries was responsible for the majority of the extractions in both males and females in two age groups (Table 3). Significant difference was seen in the reasons of tooth extraction between seven age subgroups (p<0.001, p=0.000). The rate of periodontal disease increased as the tooth caries rate decreased in the age subgroups of over 40 years. The rate of preprosthetic extractions increased in the age subgroups of over 40 years and there was no extraction for orthodontic reasons in the age groups of above 30 years (Table 4). 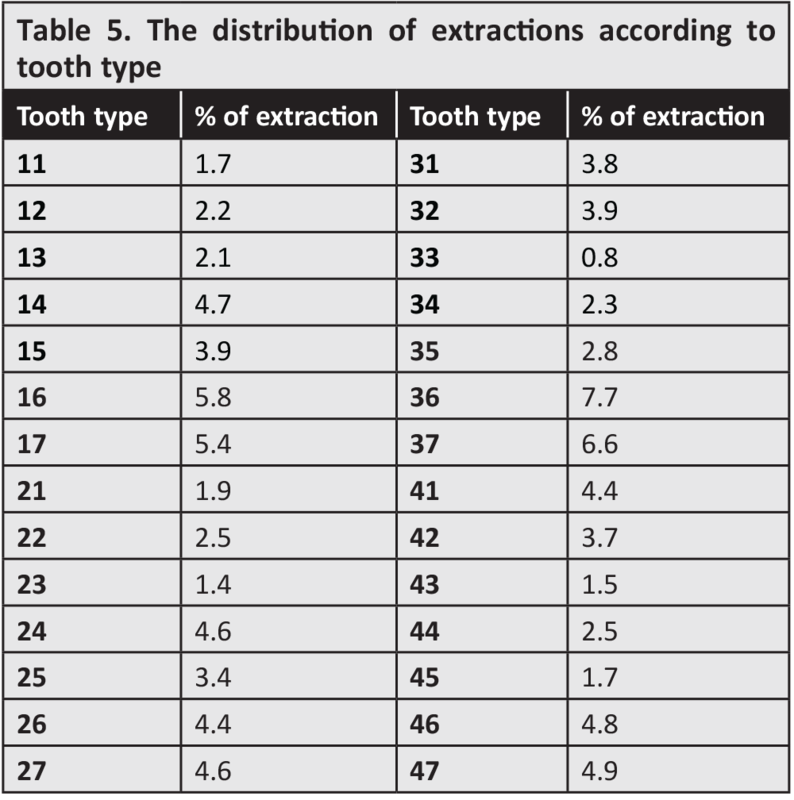 The distribution of extractions according to tooth type is given in the table (Table 5). The tooth type most frequently extracted was the first left mandibular molar. The tooth type least commonly extracted was the left mandibular canine. Tooth type had a significant effect on the extraction reasons (p<0.05). The maxillary and mandibular anterior teeth group were commonly extracted with the reason of periodontal diseases while posterior teeth group were commonly extracted with tooth caries reason. 93.6% of the study sample constituted of the urban population. There was no relationship between residence place and extraction reasons (p>0.05, p=0.286). The majority of the patients visit their dentist “in case complaint” (95.7%) and the remainig portion (4.3%) visits “biennially” or “once a year”. The frequency of dental visit had no significant effect on the extraction reasons (p>0.05, p=0.103). The majority of the patients (70.6%) had low income and the remaining part consisted of medium and high income level (29.4%). There was a statistically significant difference between income level and extraction reasons (p<0.05, p=0.023). As the income level rised the number of extracted teeth decreased in all extraction reason groups. Thirty nine percent of the 487 patients had the habit of tooth brushing before asleep. 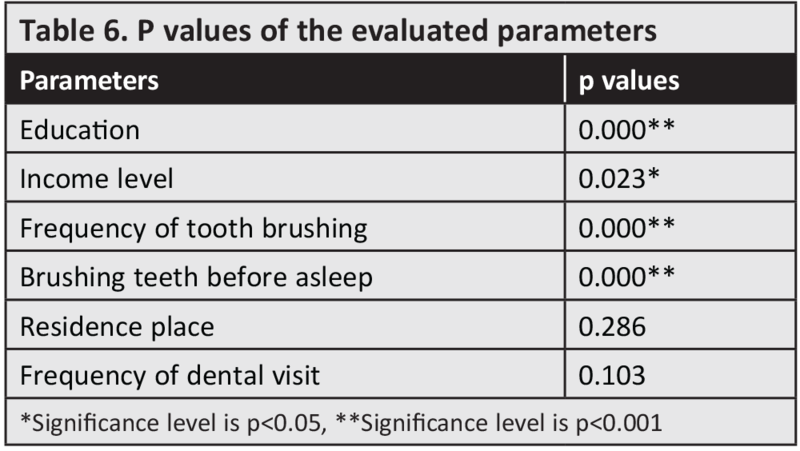 The habit of tooth brushing before asleep, the level of education and the frequency of tooth brushing had a significant effect on tooth extraction (p<0.001) (Table 6). As the level of education, frequency of tooth brushing and tooth brushing habit before asleep increased, the number of extracted tooth prone to decrease in all reason groups. 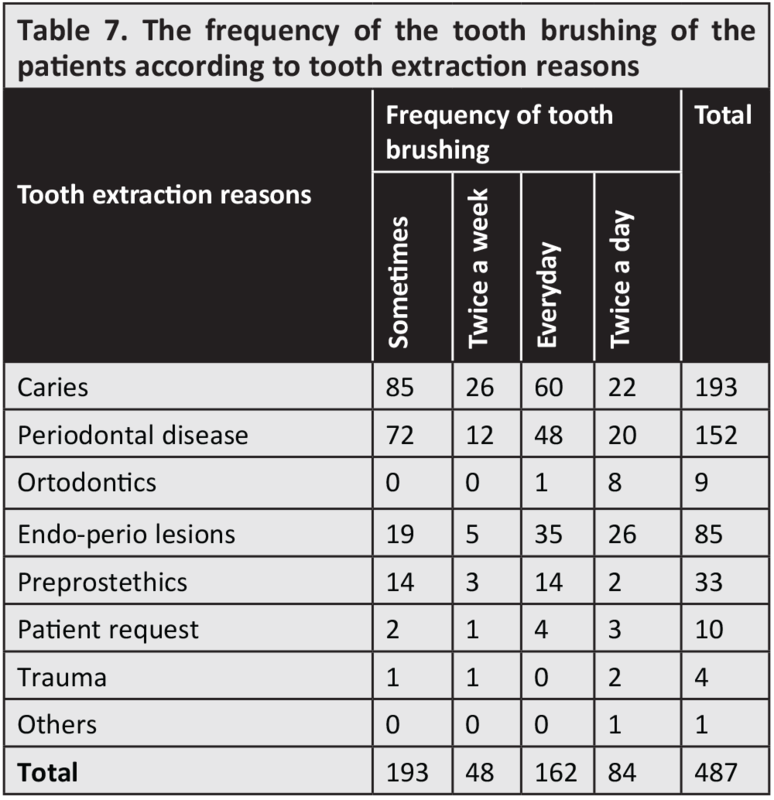 The tooth brushing frequency according to extraction reasons of the individuals were given in the Table 7. Our study demonstrated that the tooth caries was the leading reason with 39.6% of all reasons followed by periodontal disease 31.2% of all reasons of tooth extractions in accordance with previous studies (1,3-5,7,9-15) given in the Table 8. Great variation exists in the frequency and causes of tooth extraction in different countries (16). 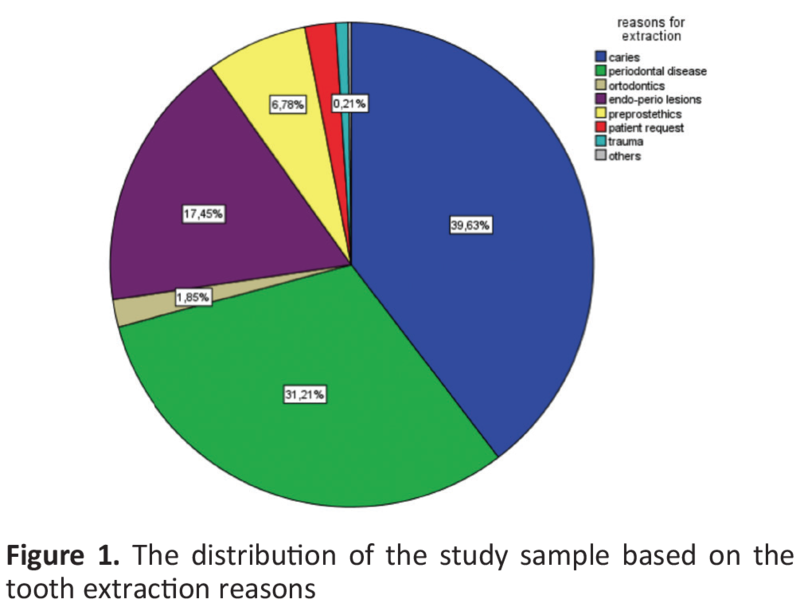 For example, caries is responsible for majority of the extractions in a wide range from 25% (3) to 70.3% (15) in the literature. This situation can be explained with sample size, study design, geographic and genetic diversities (4,5,17). Genetic factors may affect the type of saliva and tooth morphology. Geographic and ethnic differences may affect the dietary habits (18). Additionally, education, economical condition, dental care behavior and lifestyle factors such as smoking, etc. should be considered (8,19). Our study showed that tooth caries persisted as the major tooth extraction reason, but the rate of periodontal disease increased in older age group (>40 years). The number of teeth extracted teeth per person was dramatically increased in the age group of over 70 years (7.75) and 68% of those teeth was extracted with periodontal reasons. Tooth caries is a disease of young (1). In young age, proper oral hygiene cannot be achieved along with unhealthy oral habits (2). The prevalence of tooth extraction with the reason of caries decreased possibly due to stabilisation of oral hygene and nutrition habits in older age (20). Calculus deposition increases with age and calculus leads to periodontal destruction (7). The effects of periodontal disease are chronic and cumulative in nature and the extractions with periodontal reasons increases later in life (21). These results are in consistent with Yasser et al. (4), Thomas and Al-Maqdassy (18), Hull et al. (7) and Preethanath (22) while incompatible with Alesia and Khalil (16) and Murray et al. (23). Only 9 teeth were extracted with orthodontic reasons in this study among people younger than 30. Alesia and Khalil (16) found that orthodontic reasons for tooth extraction was the second major reason for extractions in Saudi population. This result could be explained with the increasing interest in the esthetic considerations (16). Murray et al. (23) found that extraction with periodontal diseases accounted for more than caries in Canada population. The average age of the sample should be considered as an anohter affecting parameter leading different results. The results of the present study indicated that gender had no effect on the tooth extraction in contrast to the study of Hassan (13). Hassan (13) claimed that this distribution could be explained by differences between genders with regard to the importance of aesthetics. Lesolang et al. (21) suggested that this situation may be due to the differences in cariogenic food affinity and treatment seeking among two genders. The tooth type most frequently extracted was the first left mandibular molar in this study. First molars are the first erupted teeth and they are exposed to local contributing factors leading to caries and early tooth loss (24). Mandibular anterior teeth are less susceptible and relatively resistant to caries than other teeth (1,5,17) and our results indicated that the tooth type least commonly extracted was the left mandibular canine. Similar findings were reported by Mohammed (25). Montandon et al. (10) suggested that controversial findings between studies could be explained by differences in the characteristics of the study population, cultural beliefs, and socioeconomic characteristics. Poor socioeconomic condition causes difficulty in reach to dental care and most people exposed to extraction of their teeth. It is mentioned that tooth loss is a socio-behavioral issue (19). Haugejorden et al. (26) concluded that demographic, behavioural and attitudinal factors had a statistically significant effect on tooth loss. Our results revealed that as the level of education, income, frequency of tooth brushing and tooth brushing habit before asleep increased, the number of extracted tooth decreased in all reason groups. Tooth loss is an indicator of poor oral health (27). The lack of education and low socioeconomic status can attribute the tooth loss increase (18,22). People with higher level of education and economical status may be more likely to consider retaining their teeth and regard the extraction as a last choice (27,28). Poor socioeconomic profile makes difficult to access to prevention and care services (24). Preventive programs are needed especially among people at low socioeconomic status (18). A couple of study conducted in Turkey on this issue up to day. Görgün et al. (29) studied on 468 patients in Ankara region. Their results showed that 45.7% of tooth extraction were due to caries, 31% were due to periodontal reasons. Ceylan et al. (30) studied in Samsun and Erzurum regions with 200 patients and found similar results. In anohter study carried out in Hacettepe University, Hayran et al. (28) classified 850 patients in two age groups, under and above the age of 25 years. The major extraction reason was caries in the age group of under the age of 25 years and periodontal reasons were main causes of extractions in the age group of above 25 years. This study evaluated people who sought dental treatment in a university hospital therefore the sample could not reflect the whole population. Within the limitations of the present study our findings indicated the caries and periodontal problems are major public oral health issue. Besides, socioeconomic and behavioral factors such as education, income and tooth brushing were found to be influental on tooth loss. Both caries and periodontal disease were the main reasons for tooth extraction in this Turkish subpopulation. Proper oral health system including efficient programs focusing on prevention and treatment of these diseases than extraction should be created and developed. Mandatory regular dental checkups must be provided by the government for diagnosing caries at an early stage before tooth extraction. This will reduce the prevalence of dental caries and furthermore decrease the future costs of surgical, restorative and prosthetic treatments. Further larger studies including all regions of Turkey are advised to investigate potential difference of tooth extraction reasons. Ethics Committee Approval: Research protocol was approved by the Necmettin Erbakan University Ethics Committee (project no: 2016/006). Informed Consent: An informed and written consent was obtained before participating the study. Surgical and Medical Practices: D.M., F.B., Concept: M.T., S.K., D.M., Design: M.T., S.K., Data Colletion or Processing: M.T., S.K., D.M., F.B., Analysis or Interpretation: M.T., S.Ş., Literature Search: M.T., Writing: M.T. Da'ameh DA. Reasons for permanent tooth extraction in the North of Afghanistan. J Dent 2006; 34: 48-51. Sahibzada HA, Munir A, Siddiqi KM, Baig MZ. Pattern and Causes of Tooth Extraction in Patients Reporting to a Teaching Dental Hospital. J Islamabad Med Dent Coll 2016; 5: 172-6. Takala L, Utriainen P, Alanen P. Incidence of edentulousness, reasons for full clearance, and health status of teeth before extractions in rural Finland. Commun Dent Oral Epidemiol 1994; 22: 254-7. Yasser F, Ghumman N, Atif S. Frequency and reasons for tooth extraction at institute of dentistry, CMH Lahore Medical College. Pak J Surg 2016; 32: 185-8. Al-Shammari KF, Al-Ansari JM, Al-Melh MA, Al-Khabbaz AK. Reasons for tooth extraction in Kuwait. Med Princ Pract 2006; 15: 417-22. McCaul LK, Jenkins WM, Kay EJ. The reasons for extraction of permanent teeth in Scotland: a 15-year follow-up study. British Dent J 2001; 190: 658-62. Hull PS, Worthington HV, Clerehugh V, Tsirba R, Davies RM, Clarkson JE. The reasons for tooth extractions in adults and their validation. J Dent 1997; 25: 233-7. Amanat D, Pourshahidi S, Ebrahimi H, Gheisari S, Amanat N. Reasons for teeth extraction in southern regions of Iran, in 2010 short title: teeth extraction in Iran. Elixir Human Physio 2012; 51: 10994-7. Richards W, Ameen J, Coll AM, Higgs G. Reasons for tooth extraction in four general dental practices in South Wales. Br Dent J 2005; 198: 275-8. Montandon A, Zuza E, Toledo BE. Prevalence and reasons for tooth loss in a sample from a dental clinic in Brazil. Int J Dent 2012; 2012: 719750. Chestnutt IG, Binnie VI, Taylor MM. Reasons for tooth extraction in Scotland. J Dent 2000; 28: 295-7. Al Sharafat FS, Al Negrish ARS. Reasons for extraction of teeth in central region of Jordan. Pakistan Oral Dent J 2008; 28: 233-6. Hassan AK. Reasons for tooth extraction among patients in Sebha, Libyan Arab Jamahiriya: a pilot study. East Mediterr Health J 2000; 6: 176-8. Anand PS, Kamath KP, Nair B. Trends in extraction of permanent teeth in private dental practices in Kerala state, India. J Contemp Dent Pract 2010; 11: 41-8. Caldas AF Jr. Reasons for tooth extraction in a Brazilian population. Int Dent J 2000; 50: 267-73. Alesia K, Khalil HS. Reasons for and patterns relating to the extraction of permanent teeth in a subset of the Saudi population. Clin Cosmet Investig Dent 2013; 5: 51-6. Chrysanthakopoulos NA. Reasons for extraction of permanent teeth in Greece: a five-year follow-up study. Int Dent J 2011; 61: 19-24. Thomas S, Al-Maqdassy SE. Causes and pattern of tooth mortality among adult patients in a teaching dental hospital. Ibnosina J Med Biomed Sci 2010; 2: 160-7. Müller F, Naharro M, Carlsson GE. What are the prevalence and incidence of tooth loss in the adult and elderly population in Europe? Clin Oral Impl Res 2007; 18: 2-14. Spalj S, Plančak D, Jurić H, Pavelić B, Bosnjak A. Reasons for extraction of permanent teeth in urban and rural populations of Croatia. Coll Antropol 2004; 28: 833-39. Lesolang RR, Motloba DP, Lalloo R. Patterns and reasons for tooth extraction at the Winterveldt Clinic: 1998-2002. Scientific 2009; 64: 214-8. Preethanath RS. Reasons for tooth extraction in urban and rural populations of Saudi Arabia. Pakistan Oral Dent J 2010; 30: 199-204. Murray H, Locker D, Kay EJ. Patterns of and reasons for tooth extractions in general dental practice in Ontario, Canada. Community Dent Oral Epidemiol 1996; 24: 196-200. Barbato PR, Peres MA. Tooth loss and associated factors in adolescents: a Brazilian population-based oral health survey. Rev Saúde Pública 2009; 43: 13-25. Mohammed AG. Causes of primary and permanent tooth extraction in children aged 3-12 years in Mosul City. Al-Rafidain Dent J 2008; 8: 24-9. Haugejorden O, Klock KS, Trovik TA. Incidence and predictors of self-reported tooth loss in a representative sample of Norwegian adults. Commun Dent Oral Epidemiol 2003: 31: 261-8. Susin C, Haas AN, Opermann RV, Albandar JM. Tooth loss in a young population from south Brazil. J Public Health Dent 2006; 66: 110-5. Hayran M, Aktaş A, Kasaboğlu O, Adiloğlu I, Öktemer K, Karabulut E, et al. Analysis of Reasons for Extractions of 1149 Teeth in a University Clinic. Clinical Dentistry and Research 2012; 36: 13-7. Görgün DS, Özperk DG, Yazıcıoğlu B. Kalıcı Dişlerde Çekim Nedenlerinin Değerlendirilmesi. Atatürk Üniv Diş Hek Fak Derg 1995; 5: 15-8. Ceylan G, Yanıkoğlu N, Yılmaz AB. Atatürk ve Ondokuz Mayıs Üniversiteler Diş Hekimliği Fakültelerine Başvuran Hastaların Protetik Yönden Değerlendirilmesi. Atatürk Üniv Diş Hek Fak Derg 1999; 9: 57-61.